The castle ruins at Donaustauf are about an hour from Grafenwoehr. Photo by Alexis Tucker. 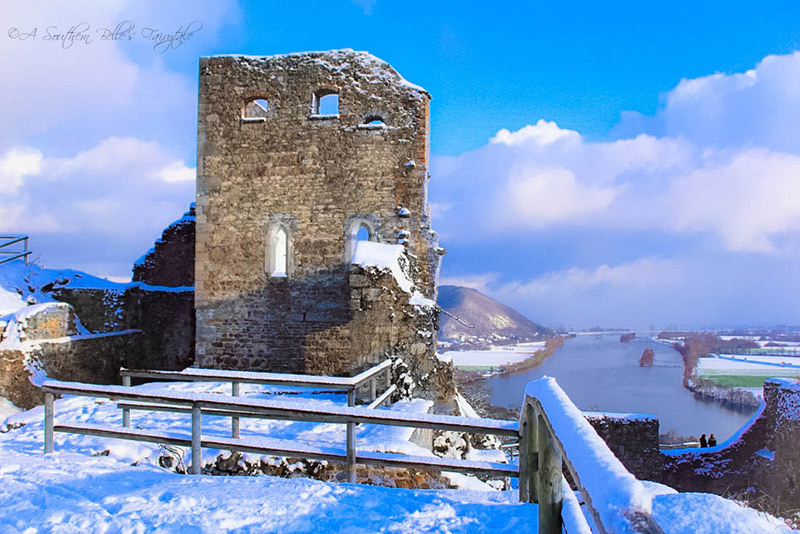 GRAFENWOEHR, Germany — It’s not every day you can experience views of the Danube River and a snowy covered Walhalla, Germany’s Hall of Fame which resembles the Abe Lincoln Memorial in Washington D.C. , to fill your day with beauty and wonder. The castle ruins at Donaustauf — about an hour from Grafenwoehr — offer just that and so much more. Much of the castle ruins are still standing today, but the castle originally stretched over the entire hill encompassing three hectares, about the size of three football fields! Can you imagine? One of the best things about these ruins is how it is free of tourists. When visiting I only saw two other people roaming the grounds. Due to the stillness, this castle makes for a wonderful place to take your time admiring and daydreaming. The fairytale like views will leave you feeling as if you had just fallen out of a storybook like Sleeping Beauty. Let your inner Aurora or Prince Charming come to life as you stand on the towering castle while staring at the dreamy sky. If you’re an artist the architecture doesn’t disappoint either. Grab a camera or sketch pad because you’re sure to find this castle to have a few unique features that other castles do not have. The pillars, although they are replicas, stand out against the grey ruins giving a Romanesque appearance. These pillars feature a semicircular niche with cushioned columns that can be seen from a variety of angles towering over you. The view looking down on the well and surrounding walls is also most impressive. It’s difficult to not anticipate every corner, for each area had a new and awe-inspiring view to offer. This dog-friendly castle, which is open daily during daylight hours, also provides free parking in the town and next to the cemetery. If that hasn’t convinced you enough, to top it off, the ruins are free entry. Take the opportunity to make magical memories with your children or your darling exploring the ruins for the afternoon. With a blue and magenta painted sky sprawled out like a painting in a fairytale book, you surely won’t regret it.